Practical instructions for learning to confront reality and succeed. Very often, when people have difficulty coping with reality, their primary problem is simply that they never had the opportunity to learn practical coping skills. Their emotional development was missing the acquisition of tools needed to deal effectively with the events of their lives. 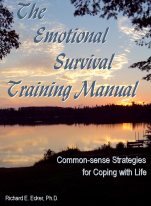 It is the purpose of Emotional Survival Training to fill in the missing elements of that education. Following a course of instruction outlined in this practical training manual, these individuals can develop an understanding of what they have missed and how they can begin to build the skills needed to face reality with greater confidence and greater assurance of success. Richard Ecker is a retired medical scientist. He has his Ph.D. from Iowa State University and has served on the faculties of Iowa State University, the University of Florida College of Medicine and Morehouse College (visiting professor) and also on the scientific staff of the Argonne National Laboratory.